With the development of internet technology and mobile intelligent terminal, people’s lives have been very convenient. For instance, shopping online has been accepted by more and more people and has been developing rapidly. In recent five years, average growth rate of e-commerce has exceeded 20%. 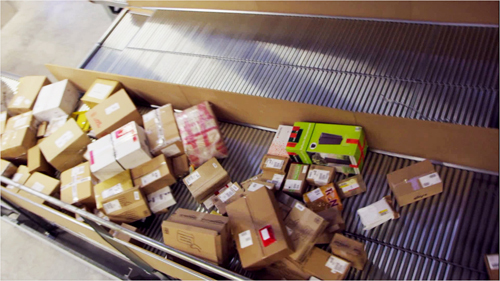 Over 70% packages and goods are delivered to the customers via express delivery. Therefore, global e-commerce and express delivery are building or upgrading efficient logistics distribution center. 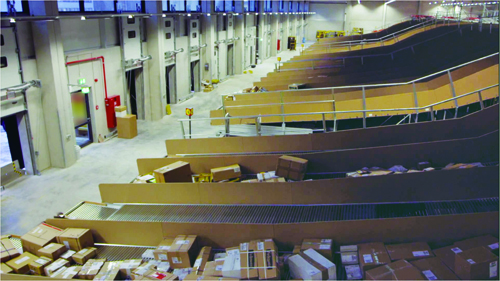 To have better space utilization with lowest energy consumption and longest service life in modern logistics center, the design engineers in sorting and distribution center focus on how to fully use conveyor slide after goods sorting and distribution. The designers want to take full advantage of slide which is 1.8 in height,1.7 in length and the inclination angle of 19 degrees for temporary storage of goods. Meanwhile, the goods can slide down with gravity rather than power to save energy, lower cost and increase lifespan. Due to various types of goods of express delivery or e-commerce, different goods weight ranging from 150k to 30kg and big friction coefficient, the engineers gave up the traditional design of wooden or steel slide. At the same time, the cost of electric-powered slide is very high. Some wearing parts have to be replaced to maintain service life. Therefore, gravity conveyor roller slide become the better choice to comply with all the requirements. However, the engineers worry about whether the small light goods like a letter weighing only 150g can slide down freely with gravity on the gravity conveyor roller with the inclination angle of 19 degrees after temporary storage and whether it has the load capacity for the heavy goods weighing 35kg as well. Plan A. Traditional motor driven slide. The plan is relatively mature and reliable while the structure is complicated and the cost high. Regular maintenance and replacement of wearing parts is needed with high cost of operation and maintenance. Plan B. Gravity slide that the goods slide down by the gravity. The structure is simple with low cost and maintenance -free. Apparently, plan B is more popular with customers. It can save much maintenance, investment and cost with eco-friendly green. However, the biggest challenge and risk is whether it is suitable for the goods like a light express envelope or a heavy box containing 24 bottles of beer to slide down on the gravity slide. The key to success is to find suitable slide material. It is impossible for the light goods as express envelope to slide down, for the sliding friction coefficient of board or steel is large. The engineers had to abandon this plan so that steel gravity conveyor roller slide is the only choice. Gravity conveyor roller delivered in the first project passed the tests for the lightest goods (150g) and the heaviest goods (35kg) successfully on the slide. The lightest goods can slide down easily and the heaviest have got reliable support and slide, whose performance is perfect. The customers are all satisfied with this type of gravity conveyor roller and the orders of rollers in five projects have been confirmed. 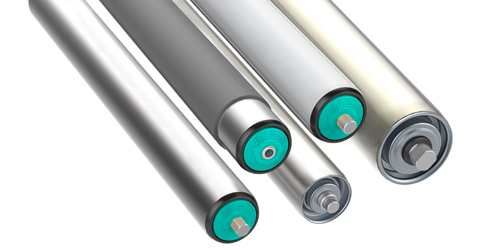 After one-year operation in distribution center, over 200,000 gravity rollers have run smoothly and stably on the slide, which gives the designers great confidence. They confirmed the design that the gravity conveyor roller will be completely adopted in 50 distribution centers in the following 2 years. The total amount of roller use will surpass 2 million. ‘This design has saved 30% of direct cost of the single slide for the customers.’ said the project principal, ‘It’s maintenance-free and integrative cost drops by more than 50%, which has met the expected goal and been low carbon and environmental protection. By the end of 2016, the amount of installed light gravity conveyor rollers in global express delivery and e-commerce distribution centers has exceeded over 4 million, which contributes to the rapid development of the industry.